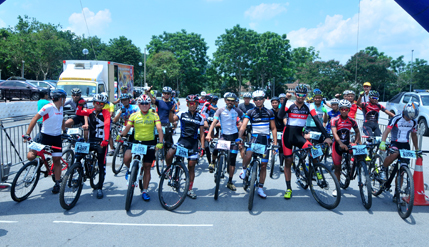 BANGI, 22 May 2014 – Malaysia’s number one mountain bike rider Ahmad Fauzan Ahmad Lutfi won the Men’s Open category in the UKM Mountain Bike Charity Challenge 2014 here last Sunday May 11. He had earlier won second place at the Setia Alam Eco Challenge Championship and had also had participated in the Le Tour de Langkawi since 2005 with the national team. The ‘Pilot 1’ rider for the para-cycling national team who will be participating in this year’s Asia Games and the Commonwealth Games, Razif Salleh was second. The third, fourth and fifth places for the Men’s open category went to Salahuddin Mat Saman, Hakimi Han and Mohd Zukri bin Tahir. A total of 89 bikers took part in the challenge which include Junior, Senior Veteran, Junior Veteran for both men and women. The race was organized by the Master’s degree in sports management students (FPEND, UKM). Director of the programme Mohd Noor Ridhwan bin Dollah said the Challenge was to collect funds for the Hulu Langat Association for the Aged, the Autism Centre and the UKM Sports Students Fund. The race started and finished at the open space in front of Dewan Gemilang, UKM. The competition was sponsored by the Malaysian National Cycling Federation, Viewnet Group, Ciclista, Endurace, Gatorade and Ameer Ali restaurant.